Foldable, lightweight frame for easy portability .- Steel double cross-brace frame. Adjustable-tension back upholstery. - Armrests are padded, adjustable and removable. 14" drive wheels for indoor and outdoor use. Quick-release seat removal for easy disassembly. Jazzy 614HD deliver outstanding performance and superb maneuverability. Enhanced 450 lbs. weight capacity - Front-wheel drive design for excellent maneuverability. Has a weight capacity of 600 lbs. 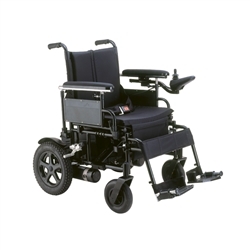 and durable construction to make it an exceptionally rugged power chair. Optional seating includes ProFlex Seat and van/pan seat - 450 lb. weight capacity. Exclusive slide seat mechanism for easy seat removal and attachment. 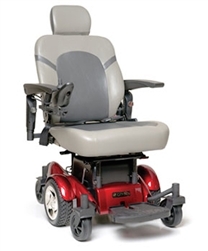 Heavy Duty Powerchairs are controlled by a joystick which allows for easy maneuverability anywhere you go. 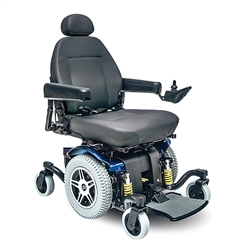 These Heavy Duty Powerchairs are bigger and have a much sturdier frame which allows it to withstand a high amount of stress. They are great for use outdoors.